For pure wine-based fun and entertainment we recommend our Interactive Wine Tasting Show. The show is hosted by a ThirtyFifty wine expert and a professional compere who work as a team to serve up wine tasting challenges and game show rounds over dinner. It's perfect for entertaining corporate clients and internal teams, to celebrate the success of a project, bring a conference to a close or as a party at year end. The show provides the chance to sample some fine wines and be amazed at your ability - or inability - to recall what you have learned. It's fast-moving, highly participative and lots of fun. Before the event we gather information on your team and company to personalise the show. Over dinner, our double-act will keep delegates entertained and involved in a series of wine-related challenges. From speed tasting to the quickfire quiz round, teams compete against each other to win points. And what do points make? Prizes! 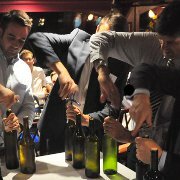 The interactive wine tasting show is suitable for groups of 20 or more. If you have a smaller group we can adapt the show - please ask and we will do our best to tailor the tasting to your needs.